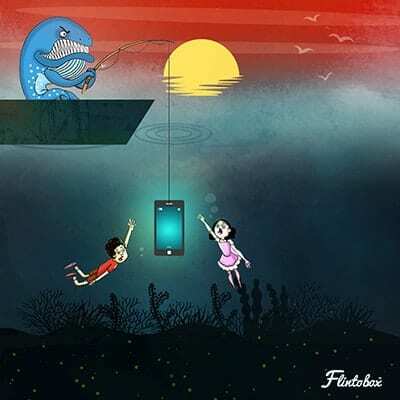 Dear parents, here’s a hard cold fact — whatever you’ve been reading about the Blue Whale Challenge is not going to save your child from falling prey to the dreadful game. If you’ve been thinking that taking the mobile phone away from your child or restricting their online usage will save them, then you’ve been given wrong advice! We know that news channels, social media, and government agencies are driving the talk, but they only seem to cover the tip of the iceberg. What lies deep below is what you must focus on. So let’s dive straight to the point — as parents, are we spending enough time to talk to our children? When was the last time you sat down with your child and asked what they spoke to their bus driver? When was the last time you switched off your phone while eating dinner with your family? 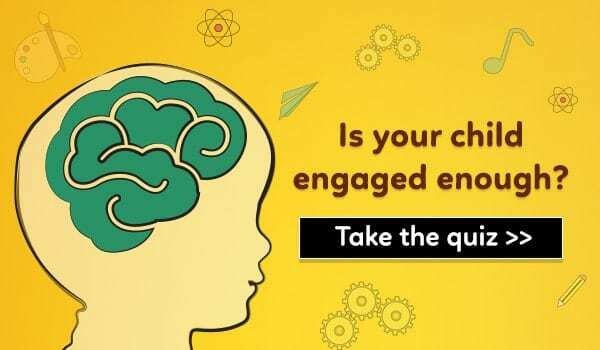 When was the last time you asked your child what their friends discuss about during lunch break? We’re talking about general everyday conversations. Where it’s just the two of you, where you listen more and hold back advice. Where your child can open up easily and is not afraid of discussing anything with you. You may wonder why this is important and how this is connected with the Blue Whale menace. Well, here’s a fact. 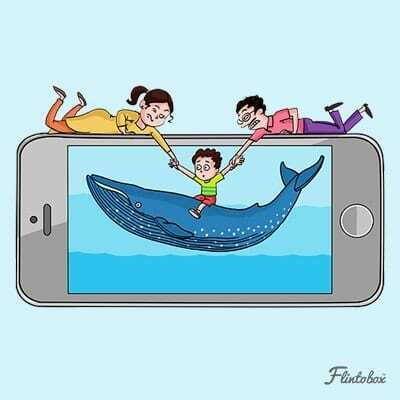 If you look at the BIGGER picture, the only reason the Blue Whale has spread its menace so much among children is a lack of open communication between parents and children. It’s true. And the sooner you accept this, the better. If you think whatever you’ve read until now makes any sense, then stay with me, and I’ll tell you how to tackle the Blue Whale monster. In today’s digital age, it is nearly impossible to keep away from social networking or the internet — which has become the backbone of this competitive, technology-driven world. And unfortunately, it is the young innocence of our homes that are paying the price. This makes us wonder; what is so fascinating about the Blue Whale Challenge or any such game? How is it managing to attract so many teenagers? And more importantly, why are parents not being able to identify them or take action in time? Well, to begin with, there’s a common misconception among parents that restricting their child’s screen time or internet usage would immediately decimate the threat. Though it is right there in the steps to follow, it does not address the root cause of these online addictions — which are usually weak family bonds, peer pressure or an overall low self-esteem! What Makes The Blue Whale Hungry? The early tween years and adolescence is when children seek validation from the society and build strong bonds even within the family. This is the part most fail to understand, or rather, seem to ignore — every child is different, and unique! Which means a child may take a little longer to reach the per se levels of what has already been set as success or maturity for their respective age! We have created a society where every child is expected to achieve and is judged solely based on preset parameters. There is hardly any place for a child who is an underachiever or an introvert. All this is of course not taking into account the societal expectations! This is where the online world plays the role of a saviour in the minds of our young ones. Ask anyone the question, “Why do you love an online game or befriend a stranger online?” and the answer will simply be –it is exciting and interactive. They are being heard! Someone is listening to them! So, is there no stopping this ever spinning wheel? Well, there’s no use complaining about technology or the lack of cyber security. Shutting down a single game or challenge can only serve as a temporary solution, for the next nefarious one will eventually pop up — and it’s just a matter of time! Instead, the best solution out of this spider’s web is to tackle the issue at the roots. When children don’t get enough importance at their home or school, they generally turn out to be introverts and insecure. They lack confidence and feel like underachievers at every point — be it in education or the extracurriculars. As a result, children, especially teenagers start hiding a lot of things from their parents. This is the onset of a long winding journey into the dark side! 2. Speak – but more importantly, listen! It is very important for parents to establish and maintain an open line of communication with their children! Communication is key in forming strong family ties. Think about it. If you don’t know how to talk to your child every day, how will you know how to communicate with them during a crisis? Open communication is crucial to understand what your child is going through and to help them tackle it. The first step would be to tune your parenting style. Involve yourselves with your children more. Listen to them, involve them, and engage with them. It builds stronger ties. It is important to adopt a parenting style that is firm yet forgiving in shaping your child into an independent and responsible individual. Forcing children to fall in line doesn’t really work. Many often advise, “Be strict with your child”. But, children have a mind of their own, they yearn to be heard. This combined with being told what to do always, makes children vulnerable, and builds a society of adults with low self-esteem. Online games such as the Blue Whale Challenge thrive on such vulnerabilities. So, instead of forcing them to abide, it is better to help them make the right decision. And the best way to do that is by explaining the consequences of a desired action. Many people don’t realise this but as a matter of fact, logic works like magic with children. Again, the importance of communication is one that cannot be stressed enough! Speak to your children everyday, set aside family time and engage in activities together that makes it easy for them to open up during troubled times. Make sure they are comfortable talking to at least one member of the family. Adolescence is a period of emotional turbulence fueled by hormonal changes which can be hard for them. So it is crucial for the child to have a vent within the family. Make sure your child is comfortable talking to at least one member of the family. Finally to identify if your child is already in the grasp of the online predators, look for signs of any change in their behaviour. The most common and primal symptom would be withdrawal – sudden changes in mood, being less social, and disengaged from routine, etc. at which point, an immediate intervention from the family is essential! To identify if your child has fallen prey to online predators, look for changes in behaviour! All things said and done, it still is essential to impose restrictions, especially when it comes to the content children are exposed to! Technology can be both a boon and bane. So parents must ensure that their children have only well-monitored access to a smartphone or laptop. Children might protest at first. But you could slowly explain the reason and encourage them to use the tab or phone in your presence. These are just some of the steps that can help make a difference. The key always lies in building a happy and open line of communication with your child. The key always lies in building a happy and open line of communication with your child! Motivate them constantly, and teach them to build coping mechanisms rather than just enforcing regime rules. Children who are heard, shown love, supported in making life choices and backed during failures, feel responsible for their own actions which is what builds strong individuals and even stronger communities! There are many parents out there who don’t know how, when and where to start educating their child about this issue. But the clock is ticking before a naive child falls prey to this gruesome phenomenon. So feel free to share this and make every parent aware of how to save their children. One share on your part can protect a lot of children out there. Why Name-Calling Your Child Is A Big No-No! Wonderful article indicating to correct children at the root not only from existing digital games but for any adversities which might come in their life. Thank you for everything. You are always helpful in all ways. Thanks it is really helpful. …..
Well said. We need to connect and communicate with our children. Most importantly we should be able to establish such a bond with our kids where in they should be able to confide in us everything. Very true! Bonding is crucial for the child’s development! Thank you very much! Excellent posting for the parents to take care of their children’s future. Amazing information. As a parent will definitely implement it. excellent , meaning ful words .. thank u so much..